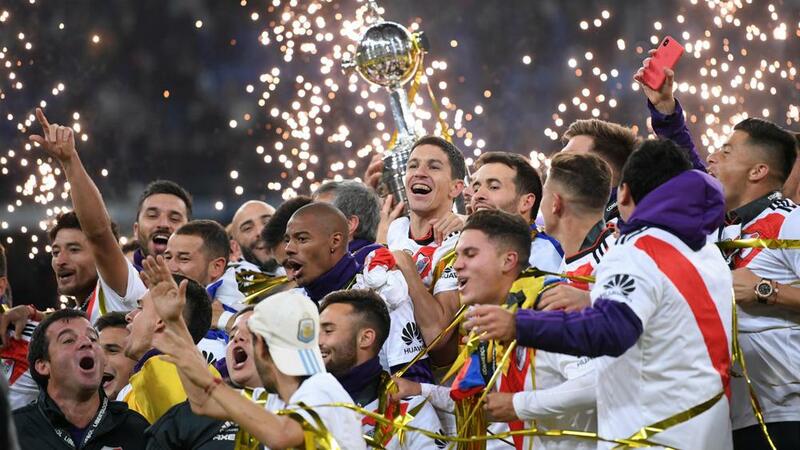 Copa Libertadores champions River Plate will face Internacional in their 2019 defense after the draw for the group stage was made. After upstaging bitter rivals Boca Juniors 5-3 on aggregate for a fourth Libertadores crown, River have been paired with Brazilian side Internacional, Peru's Alianza Lima and a qualifier from the preliminary phases in Group A.
Runners-up Boca were drawn in Group G alongside Copa Sudamericana champions Atletico Paranaense, Colombia's Deportes Tolima and Bolivian outfit Jorge Wilstermann. The group stage will get underway in March, with CONMEBOL announcing an increase in prize money at Monday's draw – the 2019 champion to receive $12million, up from $6m, while next year's showpiece will be decided in one match, not over two legs for the first time. CONMEBOL president Alejandro Dominguez also called for an end to violence after the eagerly anticipated Libertadores final between River and Boca was marred by clashes. The blockbuster showdown was twice suspended in November due to an attack on Boca's team bus, resulting in the second leg to be controversially staged at Real Madrid's Santiago Bernabeu in the Spanish capital earlier this month. Reflecting on the 2018 campaign, which River sealed with a 3-1 win over 10-man Boca, Dominguez said: "Let's think about what kind of football we want to distribute and bet and develop in. "Football, the king of sports, has all the best values ​​as sports, and we, as presidents, must set an example. Let's end violence, we end up with intolerance, the example has to start with us. "We have the most beloved product in the world, we have the players, the fans, we have everything. We have shown it to the world and the world responded with great expectation to our competition." Next The Locker Room: Who Got The Luck Of The UCL Draw?